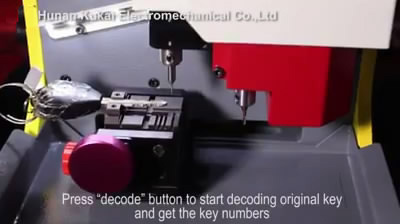 SEC-E9 Key Cutting Machine How to use SEC-E9 to cut Toyota TOY43 keys in 2 ways? 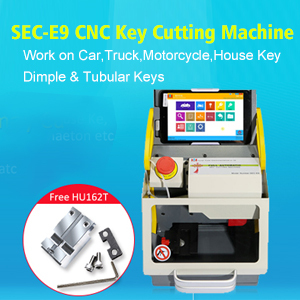 Post on how to cut Toyota TOY43 keys with SEC-E9 automatic key cutting machine in 3 steps: Enter the key data, get the key number and cut the key. 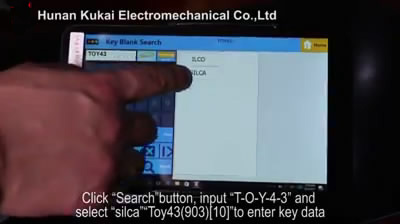 Enter the key data of Toyota TOY43 in two ways. 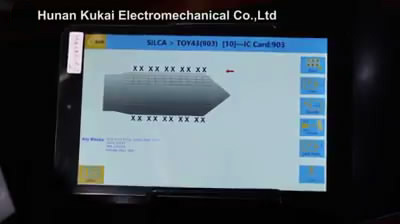 Way 1: Select car manufacture, brand and year. 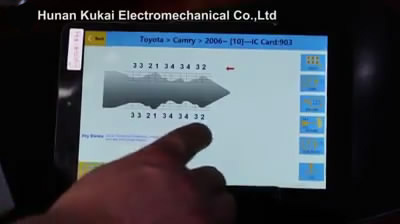 Tap “Automobile” button and “Toyota – Camry – 2006 - to enter the key data. 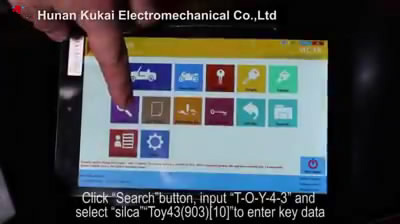 Tap “Search” button, input “TOY43” and select “Silca” – “TOY43(903)  ” to enter key data. Tap “Info” button to see the key is aligned by tip. 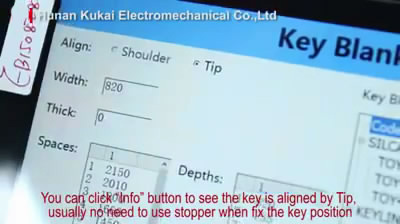 Usually no need to use stopper when fix the key position. Step 2. 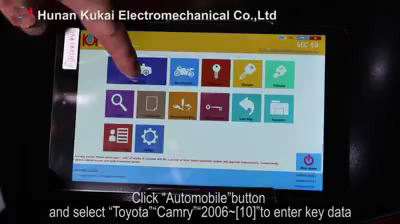 Get the key numbers of Toyota TOY43 keys using SEC-E9 in 3 ways. 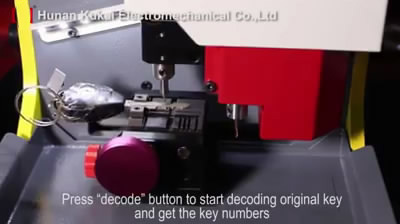 Way 1:Decoding the original key. 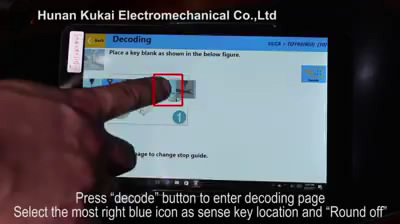 Tap “Decode ” button to enter the decoding page. 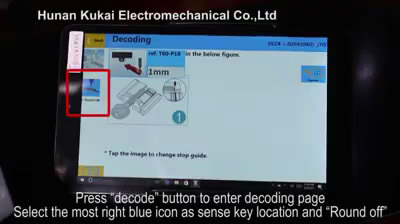 Select the dark blue icon as sense key location and “Round off”. 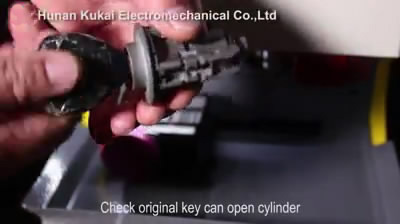 Check if the original key can open the cylinder. 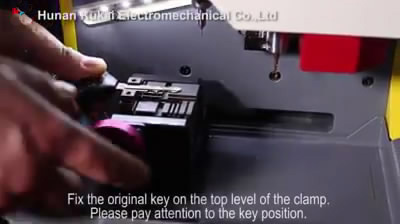 Fix the original key on the top level of the clamp. 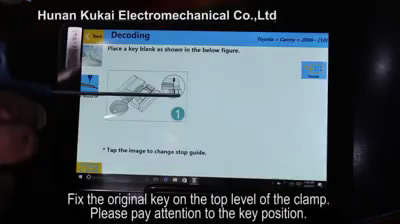 please pay attention to the key position. 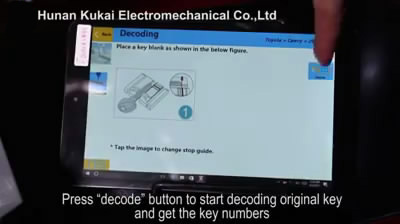 Tap the “Decode” button to start decoding the original key and get the key numbers. 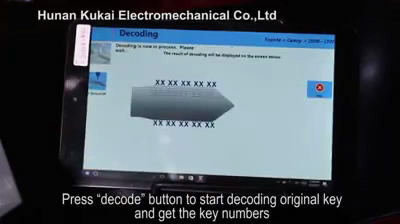 Way 2: search key code. 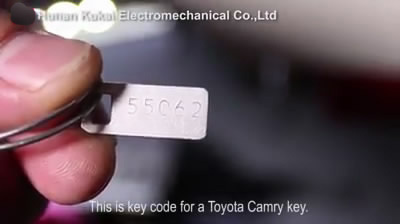 This is key code for Toyota Camry key. 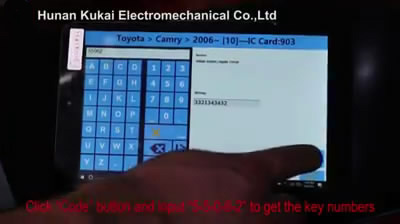 Tap “Code” button and input “55062” to get the key number. 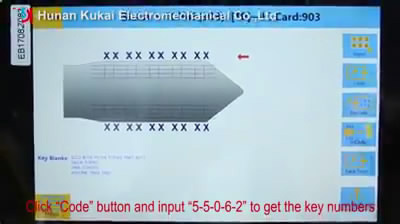 Way 3: Input key numbers directly. 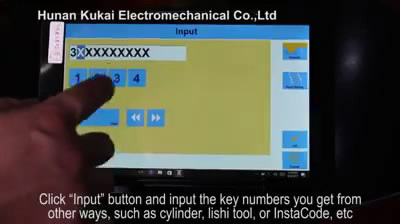 Tap “Input” button and input the key numbers you get from other ways, such as cylinder, Lishi tool, or instacode, etc. Step 3. 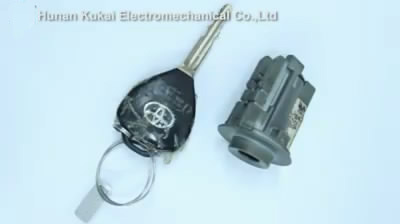 Cut a new Toyota Camry key. 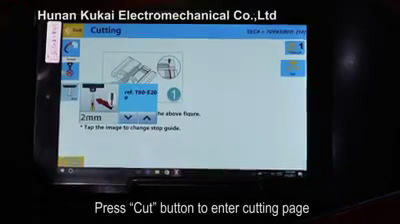 Tap the “Cut” button to enter the cutting page. 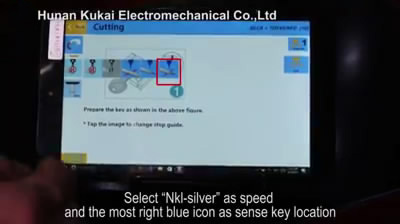 Select “NKI-silver” as speed and the most right blue icon as sense key location. 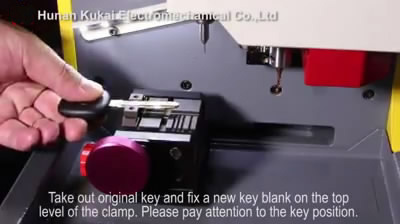 Take out the original key and fix a new key blank on the top level of the clamp. Please pay attention to the key position. 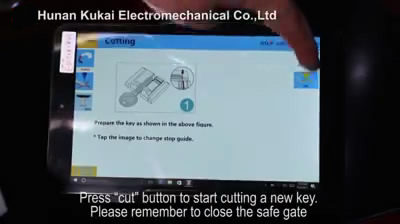 Tap “cut” button to start cutting a new key. Please remember to close the safe gate. 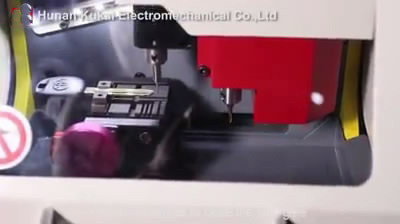 SEC-E9 Cutting is done. Open the safe gate. 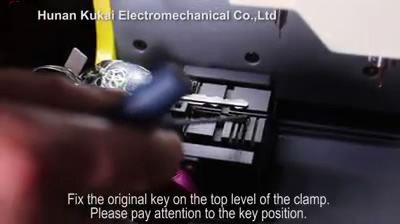 Clean the clamp & the new keys. Take out the new key. The new key is working well. 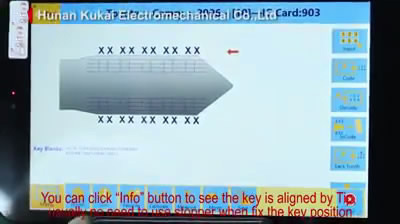 This is the reason why you cannot decode Lexus by Condor mini-xc key cutting machine.. 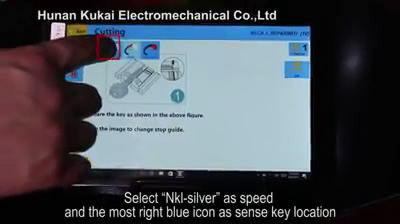 If you think BMW multi tool can only make key for BMW CAS immobilizer system, you are out of date. 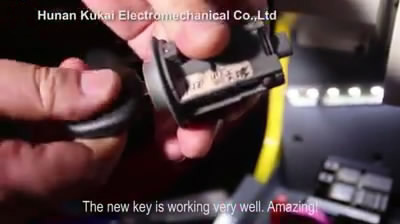 BMW multi tool can also make key for BMW EWS. Then how to do?